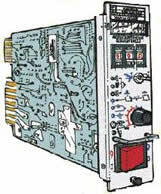 Temtron can repair all hot runner controls, mainframes, and cables. Standard pricing is available on most repairs, including DME, Athena, Gammflux, and many others. All hot runner control repair and calibration tasks are performed in-house with equipment traceable to the National Institute of Standards and Technology . Temtron can build most special or custom cables to fit most needs. Example: Run molds equipped for INCOE using a DME Hot Runner control system or the reverse. Tell us what YOU need! We maintain a substantial parts inventory. No time lost waiting for parts ordered. We will beat any advertised price of hot runner control repairs. Hot Runner Temperature Controls which no longer operate properly or become damaged, often need to be repaired quickly and at a reasonable price. Over the years, Temtron has developed some repair and calibration techniques that allow us to economically repair almost all modules that we receive. One example of this is our foil replacement process. This process allows us to repair units with extensive damage to the printed circuit board edge connector foils as shown in the before and after pictures. Ensures that the controller you sent us is the exact one we return to you. Allows in-house tracking of work in progress during the repair process for faster turn around. During repair, the number determines what component and hardware updates have been performed, so your control is as current as possible. Control module fuses must be rated at 250 VAC, type F (fast blow). This will protect the module in the event of a shorted heater. Fuse current rating should match the module size - usually 15 or 30 amp. The power switch should be in the "off' position before you install or remove the module from an energized mainframe (mf switch "on"). This will prevent edge foil damage. The fuse holder should grip the fuse ends tightly to maintain good contact. Pinch the fuse holder clips together some if the fuse is loose in the holder. Be aware of soft, easy to bend clips, as they probably will not maintain good fuse contact. Poor fuse contact can produce small electrical arcs causing pitting and oxidation, and will eventually cause premature fuse blowing.